Tuesdays can be a pretty rough day to cook in our house. We don’t get our Greenling local box until Wednesday each week and I wait to take care of other grocery shopping until Thursday or Friday. Sometimes I forget to go grocery shopping altogether. That means every Tuesday, we’re usually out of milk, scraping at the dregs of the produce in our fridge, and if we’re lucky, we’ve still got a few random tupperwares of leftovers. The past few weeks, though, Tuesdays have been great! I found an awesome soup recipe whose ingredients all last over a week in the fridge! It’s a huge plus that they all happen to be local-box favorites that are almost always in season in Texas. The non-refrigerated ingredients keep a long time in the pantry and are super cheap, plus the finished soup reheats beautifully. Oh yeah, it’s really healthy, too! You’ll see that the recipe adapts really easily to what you have on hand– if it’s been in the crisper for a week and it’s still good, it will probably work in this soup. No grocery panic, and no wasted local box produce! Plus any combination of herbs and seasonings that you enjoy. I like 1/4 tsp each curry, cinnamon, nutmeg, and cardamom. An alternative would be 1/4 each teaspoon rosemary, thyme, and a few bay leaves. Choose a flavor profile and go with it! 1. Chop up all the veggies and fruit. You can leave the skin on everything but the butternut squash. 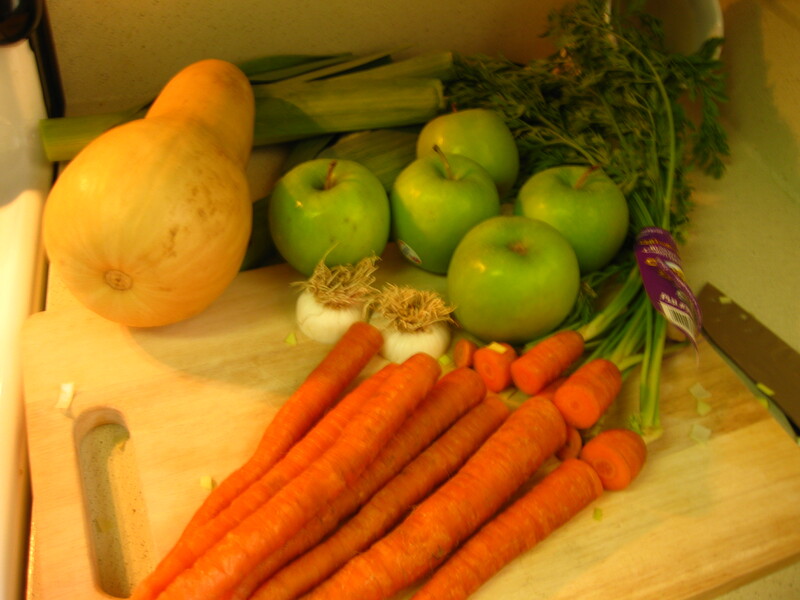 Take care to core and deseed the apples and butternut squash! Hint: microwave the whole squash for about 4 minutes while you collect the ingredients. Once it has cooled, it will be much easier to cut and cube than if it were raw. 2. Saute all the fruits and veggies in olive oil in a really big soup pot for about 20 minutes, until it’s all soft and shiny. 3. Add the wine and stir, then add the broth. Bring to a simmer and cover. Simmer, covered, at least 20 minutes. Midway through the simmering process, taste the soup and add the seasonings you like. It is important for this recipe to taste as you go, especially if you experiment with the quantities and types of veggies and broths you use. 5. Remove the bay leaf and any rosemary stems, if applicable. Use a blender to puree the soup and serve. 6. Bask in the glory of your cleaned-out crisper drawer. Feel thrifty and healthy and regular. (This soup has a lot of fiber.) Enjoy!! This entry was posted in Main Dish, Recipes, Soups & Stews, Vegan, Vegetables, Vegetarian and tagged Broth, Butternut squash, Cook, Olive oil, Soups and Stews. Bookmark the permalink.